The purpose of the InterPARES 3 International Terminology Database (ITD) is to support records professionals – archivists, records managers and information managers – in understanding records-related concepts that address issues of preserving authentic records in electronic systems. Founded in Archival Science, Diplomatics and Information Science, the terms in this database are central to the InterPARES research, and facilitate communication and understanding across records-related disciplines. The ITD includes a Glossary and a Dictionary. The Glossary is an authoritative list of terms and their definitions that are core to our understanding of the evolving records creation, keeping and preservation environments. These are the definitions used in the course of InterPARES research. Definitions are context specific, however, and terms may not be used uniformly by all our test bed partners. When a term used by a particular test bed differs in its definition from the same term as it is used by InterPARES researchers, that term will be defined in the research documents pertaining to that test bed. To reflect the international nature of records-related disciplines in general, and the InterPARES research in particular, the Glossary includes translations of many terms in the languages of our partners. This work of translation is ongoing and terms will be added as translations are submitted and approved. The Dictionary includes definitions of the same terms as they are commonly used in specific disciplines or communities of practice. It includes the source discipline where appropriate. The dictionary definitions come from existing dictionaries and glossaries in common use. The Glossary provides the approved term and definition used in research (working documents and published documents) that comes from InterPARES 3. As rapidly as technology is evolving, so records-related terms may be refined. To understand this evolution, terms in the Glossary have been drawn from the InterPARES 1 and InterPARES 2 glossaries, and new terms or definitions have been added, as appropriate. If the definition in current use is different from those of InterPARES 1 and 2, the latter are reported in the Dictionary. Each term in the Glossary lists the part of speech, and provides a definition, identified by source as InterPARES 1, 2 or 3. The Dictionary provides discipline-specific definitions of terms relevant to the InterPARES research and records professionals. Each term is defined by the glossary definition, in bold type, followed by definitions common to other disciplines or communities of practice. Each discipline or community of practice is identified at the end of the definition. Figure 1, below, shows an example. The first definition of “record” is the InterPARES 3 Glossary definition, identifiable by the bold font. The second definition derives from InterPARES 1 (identified in square brackets) and can be found in the Dictionary. 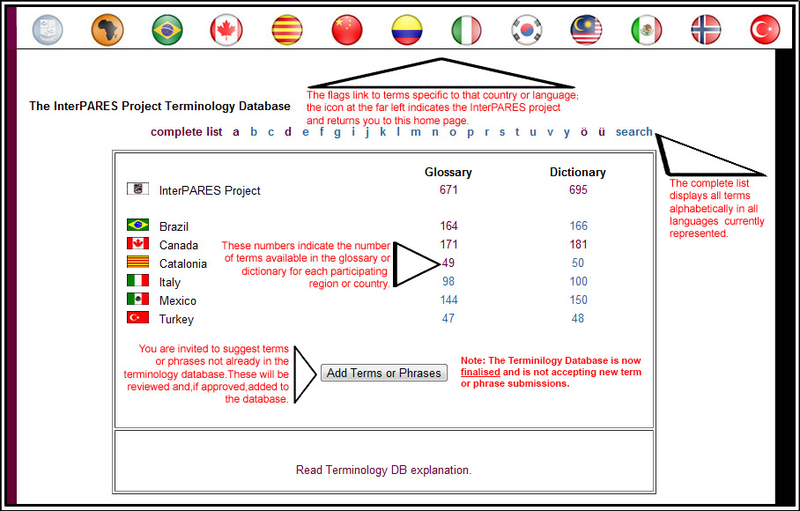 Return to the InterPARES 3 Project Terminology DB page.